How to stretch your back with the 6 best back stretches for back pain relief. Back pain can range from simply annoying to completely debilitating. Back pain actually refers to a group of injuries or disorders that can cause pain in the back area. Back pain may occur anywhere along the back. It may be bone or muscle related pain. The pain may be focused in one area of the back or may radiate to other areas. Pain in the back can take many forms and have many causes. Back pain is more than just pain in the back; it has underlying causes that must be addressed to reduce the pain. Failure to correct the underlying causes can lead to chronic back problems and continued back pain. 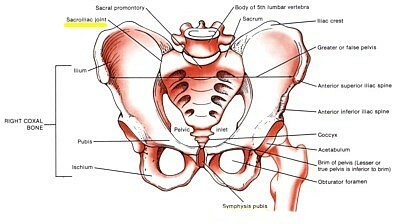 4 in the coccygeal region. 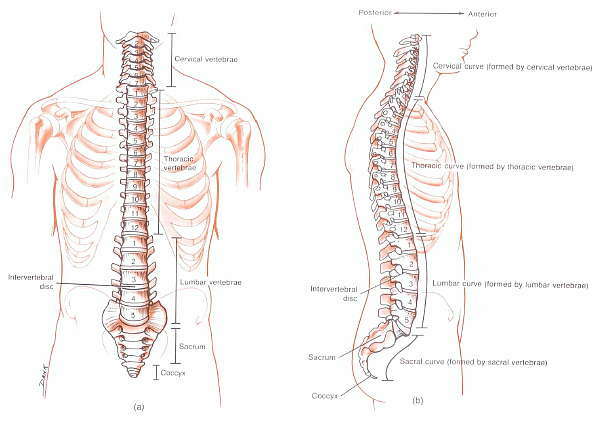 The vertebrae all fit together in a straight line when viewed from the front or back, with a natural curvature that is convex in the cervical area, concave in the thoracic, back to convex in the lumbar, and ending with a concave curve in the pelvic region (sacral and coccygeal.) The vertebrae are held together with strong fibrous ligaments. 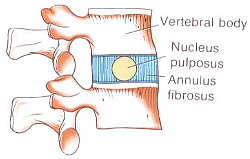 In between the vertebrae are fluid filled discs that allow for limited movement and provide cushioning. The muscles of the back are connected to the spine by strong tendons. The upper back is covered by the trapezius muscle, the rhomboids (major and minor), and the teres major. The mid portion of the back is covered by the large latissimus dorsi muscle. The erector spinae group attaches to and supports the spinal column. These muscles all anchor on the spinal column. The upper and mid-back muscles all attach to the arm or shoulder, while the erector spinae group anchor at the spine and attach to the ribs and pelvis. There are many nerves that come out of the spinal column and travel through or under the musculature of the back. The ribs attach to the spinal column in the back, also. The kidneys are tucked deep in the back. The abdominal muscles and the hip flexors also have a direct impact on back pain at times. As stated above, back pain has many possible causes. These causes may be skeletal, muscular, or nervous system in nature. The vertebrae of the spinal column are designed to rest atop each other in a very organized pattern. If they slip out of place they put pressure on the nerve bundles that exit at that point and stretch the ligaments and tendons attached to them. Fractures to the vertebrae will also cause pain due to the injury itself and the inflammation surrounding the injury. The discs that provide cushioning for the vertebrae can bulge or rupture at times causing extra pressure on the nerves and friction between the bones. A bulging disc will also cause problems with flexion and extension in that joint of the spine. These are oftent he result of muscle imbalances. Any of the muscles of the back can be strained, causing pain. The most commonly strained muscles are the erector spinae. This results in lower back pain and stiffness. The latissimus dorsi can be strained as well, leading to pain under the arm and across the middle of the back. The muscles of the upper back can be strained, especially with postural issues. 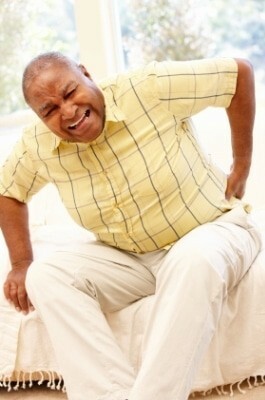 Back pain can be caused by acute injuries or chronic conditions. Acute injuries can cause the muscles to stretch or tear (a strain), fractures to the vertebrae or ribs, dislocations or subluxations of the vertebrae or ribs, deep bruising, or a bulging disc. Chronic conditions, most commonly muscle imbalances, can result in many of the same issues. Imbalances may occur in strength, flexibility, or both. The imbalance itself can cause pain, but more often it leads to another condition that results in pain. A common imbalance resulting in back pain is the shortening of the hip flexors and weakening of the gluteus, and other muscles of the hips, from extended time spent sitting. 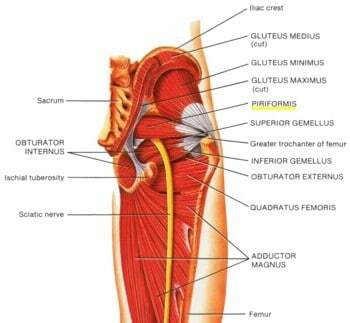 This causes an excessive forward pull from the tight hip flexors and can lead to injury in any of these muscles. Pain – at the sit of the injury or along the nerve pathway. This pain may increase with movement and also may become worse with prolonged periods in one position. Stiffness – along the spinal column or in the injured muscle. 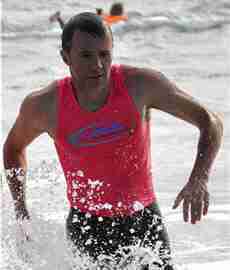 Weakness – below the injury site or throughout the back and extremities. Tingling / Numbness – in the lower extremities, especially after sitting for extended periods. Avoiding back pain in the first place is a much easier course than treating it after it occurs. Prevention of back pain involves avoiding those underlying causes mentioned above. Muscle imbalances can be avoided by keeping good posture, working the muscles evenly, and practicing good back stretches. Sitting is one of the major culprits in back pain. Sitting for extended periods of time can lead to back pain, especially in the same position. Instead, change positions every 10 minutes or so. Get up and walk, stand and stretch, change your foot and leg positions. Anything you can do to change the body position will help. Standing in the same place for a long time can be a problem, too. Proper footwear, with neutral insoles, will help cushion the body and put it in the proper position. A major problem many people experience is shifting weight from side to side, and eventually putting all the weight on one side for an extended period. This puts unbalanced pressure on the spine and pelvis. Instead, try to keep even weight on both feet. Lifting is an area of common back injury. Improper lifting form, especially when muscle imbalances already exist, is the most common cause of back pain. If a muscle imbalance already exists and you lift a load that is heavier than those weakened muscles can handle they will become injured. Inflexible or weak muscles are easily injured. Correcting the imbalances and postural deficiencies will help prevent lifting injuries. Stress is another common injury catalyst. Stress causes the muscles to tense up and lowers your tolerance for pain. This is a formula for injury. Stress is a part of everyday life, but it can be minimized. Deep breathing, a brisk walk, or talking about your problems can all help alleviate stress. A strong, flexible back is much less susceptible to injury. Follow a good program of back stretches and strengthening, reduce stress, practice good posture while sitting and standing, and lift with proper form and you can help prevent many of the causes of back pain. Getting back pain relief can take on many forms, depending on the type and source of the pain. As stated above, the correction of the underlying cause of the pain is the most important step in treatment. There are many traditional methods of treatment that have been used by many; however, these may not be the best choices. Traditionally, back pain sufferers have gone to orthopedic surgeons to address the problem. These doctors often prescribe cortisone shots and anti-inflammatory medications to deal with the pain. The problem here is that it does not address the underlying cause, so it is a short term fix. Surgical interventions are also often prescribed. These may help with the immediate issue causing pain, however the new scarring will cause additional pain and the original cause of the problem may not be fixed. So, the pain will return again when the same forces are applied to the area. Physical therapy is another commonly sought after option. The idea behind physical therapy for back pain is good; however, it does not always follow through. A physical therapist will work to reduce the pain symptoms, but a busy facility may seek to do only that. The underlying causes may be ignored in the quest for immediate pain relief. While the pain may go away for a short time, it will return once the underlying problem flares up again. Chiropractic care is another popular option. This involves the manual manipulation of the bones, tendons, ligaments and muscles to realign the bones. Unfortunately, the same forces that pulled the bones out of alignment in the first place are still there and will continue to work on the bones again. Unless the muscle imbalances are addressed the problem will continue. Massage is another good option. This will help address imbalances in flexibility, allowing the therapist to work on muscles that are tight and inflexible. They will also be able to break up scar tissue in injured muscles, allowing them a greater range of motion. And finally, addressing the muscle imbalances through post-rehab fitness training will help reverse the conditions that caused the pain in the first place. Back pain stretches and strengthening exercises for the back muscles will allow them to support the spinal column without causing excess pressure. Flexibility is essential for a healthy back and this can be addressed with the videos of back stretches below. The following 6 back stretches will show you how to stretch your back for maximum back pain relief. The back stretches below cover the upper back, middle back and lower back, and improve flexibility for back flexion, extension and rotation. Be sure to read the instructions and watch the back stretch videos carefully to make sure you’re doing the stretches properly. If you currently have any chronic or recurring back pain please take extra care when performing the stretches below, or consult with your physician or physical therapist before performing any of the following stretches. Flexion Extension Back Stretch (1:23) Kneel on your hands and knees. Look up and let your back slump downwards. Then let your head fall forward and arch your back upwards. Perform this stretch slowly and deliberately, resting your weight evenly on both your knees and hands. Hold the back arch stretch position for a minimum of 20 seconds and then slowly move into back slump stretch position. Kneeling Back Rotation Stretch (1:24) Kneel on the ground and raise one arm. Then rotate your shoulders and middle back while looking upwards. Keep your arm pointing straight upwards and follow your hand with your eyes. This will help to further extend the stretch into your neck. Hold the stretch position for a minimum of 20 seconds and then repeat with the opposite arm. Knee-to-chest Lower Back Stretch (1:32) Lie on your back and keep one leg flat on the ground. Use your hands to bring your other knee into your chest. Rest your back, head and neck on the ground and don’t be tempted to raise your head off the ground. Hold the stretch position for a minimum of 20 seconds and then repeat with the opposite leg. Lie on your back and cross one leg over the other. Keep your arms out to the side and both legs straight. Let your back and hips rotate with your leg. Keep your shoulders on the ground and avoid lifting them during this stretch. Do not throw your leg over to the side; simply let the weight of your leg do most of the stretching for you. Hold the stretch position for a minimum of 20 seconds and then repeat with the opposite leg. Kneeling Reach Forward Back Stretch (1:02) Kneel on the ground and reach forward with your hands. Let your head fall forward and push your buttocks back towards your feet. Hold the stretch position for a minimum of 20 seconds. Stand with your arms out in front and your hands crossed over, then push your hands forward as far as possible and let your head fall forward. Hold the stretch position for a minimum of 20 seconds. Want more back pain stretches? Lawand, P. Júnior, I. Jones, A. Sardim, C. Ribeiro, L. Natour, J. (2015). Effect of a muscle stretching program using the global postural reeducation method for patients with chronic low back pain: A randomized controlled trial. Joint Bone Spine, 82(4), 272-277. Sherman, K. Cherkin, D. Wellman, R. Cook, A. Hawkes, R. Delaney, K. Deyo, R. (2011). A randomized trial comparing yoga, stretching, and a self-care book for chronic low back pain. Archives of Internal Medicine, 171(22):2019-26. Searle, A. Spink, M. Ho, A. Chuter, V. (2015). Exercise interventions for the treatment of chronic low back pain: a systematic review and meta-analysis of randomised controlled trials. Clinical rehabilitation, 29(12), 1155-1167. Shiri, R. Coggon, D. Falah-Hassani, K. (2017). Exercise for the Prevention of Low Back Pain: Systematic Review and Meta-Analysis of Controlled Trials. American Journal of Epidemiology, 187(5), 1093-1101. Gordon, R. Bloxham, S. (2016). A Systematic Review of the Effects of Exercise and Physical Activity on Non-Specific Chronic Low Back Pain. Healthcare, Vol. 4, No. 2, p. 22.